Just as planets exert a measurable gravitational pull on smaller objects around them, six major forces battle for the souls of our kids today. Each of these environments has the power to draw like a magnet—either attracting kids to God or repelling them from Him. Family/Home: The family is the first of two institutions commissioned by God Himself. For this very reason, the family is under spiritual attack. For most children, the healthy influence of the home is waning. As secular homes succumb to increasingly worldly values, Christian homes struggle with shifting priorities. Church: The Church is the second divinely ordained institution—a beacon of hope, salt, and light for every generation. The influence of the North American church on both the culture and on individual Christians is clearly eroding. When all else crumbles, however, the true Church will remain intact. School: Educators and administrators are experiencing dramatic role changes. With the disintegration of the family unit, children look to their teachers for emotional support as well as for academic training. Teachers still have many opportunities to influence children for God. Media: Technology plays an increasingly prominent role in the lives of children. TV viewing continues to increase. Computers, tablets, smartphones, video games, and other digital devices are not only changing what kids see and hear, they also alter how they communicate. The media are powerful tools that children can learn to use judiciously. Peers: As the influence of family members decreases, the impact of peers inevitably grows. Instead of looking for support at home, many children seek approval and identify from their friends. Teaching kids how to choose good friends is essential. Culture/Community: Every town and city offers unique characteristics and demographics that affect a child’s development. Children who grow up in the inner-city, in rural towns, and in sprawling suburbs are exposed to radically different circumstances. The secularization of society is increasingly evident. Children need God’s lens to interpret the various cultures and people they encounter. Action Plan: Your children are in the formative stages of molding their worldview. Walk in their shoes. Put yourself in their place and objectively examine these six magnets. Seek specific ways to strengthen the influence of the family and the church. Find ways to navigate the other environments and infuse them with Biblical values. 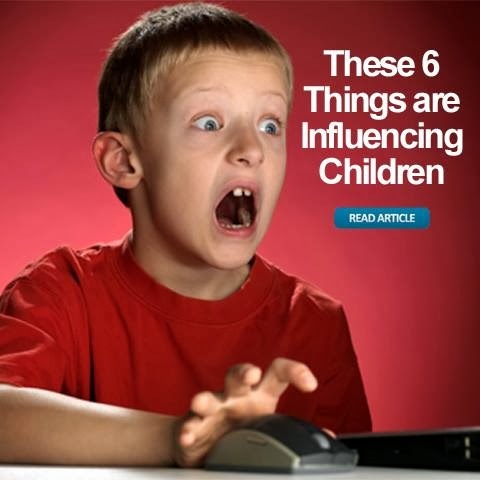 Discuss with your kids how these influences affect them. God’s people must learn how to be salt and light in today’s world. The key to the church’s lifelong influence on children is in becoming more relevant and more vital—to train, not merely entertain. Learning how to channel these six environments for good—and for God—might be the catalyst that launches a spiritual revolution that will once again transform the planet! LeRoy Eims explains, “There are five essentials a new believer needs to develop a life of discipleship. At the top of my list is love. The second need of a new Christian is protection. The third essential is food [Scripture]. The fourth need is fellowship with other believers. The fifth essential is training. Don’t just tell them what to do and leave them on their own. Show them, walk with them, and enjoy their progress. New Christians need someone—not something—to help them. That’s you!” Children need meaningful, shared-life relationships. That’s the heart of discipleship. DiscipleLand’s family of Biblical resources forms a complete Children’s Discipleship System™ – an intentional, relational, and transformational process designed to help children know God intimately, love Him passionately, and to serve Him selflessly.